The tough and lightweight Parole A-SES Lens Set Glasses from Bolle are built for high performance. The B-20.3 polycarbonate lenses are made from premium-grade resin, making them twenty times more impact-resistant than glass at a third of the weight. The semi-rimless design provides a wide field of view and preserves wearer's peripheral vision. The Parole lenses include Bolle's unique Carbo Glass coating, which acts as an armored shell on both faces to protect against scratches. 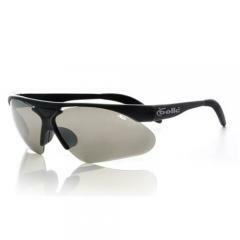 The innovative sunglasses can be fitted with Bolle's Optics Control System, allowing for convenient switching between interchangeable pairs of lenses for maximum versatility. The sunglasses include a cleaning cloth and carry case for effortless maintenance and safe storage.